These standard terms of sale, which shall be applicable as from the placement of the order, shall govern all orders received by La Balustrade bookshop. The articles are proposed within the limit of stocks available and for those not in stocks within the limit of their availability from publishers. Some articles may be temporarily or permanently unavailable from publishers. 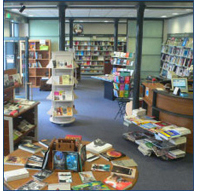 La Balustrade bookshop disclaims liability in the event one or more articles are unavailable. If one or more articles happen to be unavailable after the order has been placed, we will personally notify the customer of this as quikcly as possible by e-mail or by post or by téléphone. La Balustrade bookshop shall send confirmation by e-mail for all orders placed by Internet, provided the customer has provided his/her/its e-mail adress. The order shall be processed as quickly as possible as from receipt of payment (see Payment). Price are quoted in euros, all taxes included, appart from a contribution for transport costs. Books are sold in compliance with the fixed price of books regulation applicable in France. In the event the orders originates from a country other than France, custom duties or other local taxes (local VAT, customs tax, import duties, etc) may be due and payable. The customer shall be exclusively responsible for paying said duties and he/she/it/ shall be enterely responsible for declaration and payment to the proper authorities of the country. All orders, regardless of their origin, shall be invoiced and payable in euros only. La Balustrade bookshop shall retain title to the products until the price has been paid in full, regardless of the delivery date of the product. Purchases shall be paid by bank card. The customer must specify the number of his/her/its card as well as its validity date. He/she must also provide the three cryptogram figures at the back of the card. Our bank has secured this data capture opération. The amount of orders paid by bankcard is cashed in on the date is dispached; only delivered products are invoiced. The articles are delivered to the delivery adress mentioned at the time of ordering. The time limits mentioned when the order was placed are average time limits given for information and they may vary according to the destination. In the event of a delay in delivery or a stock outage with the publishers, La Balustrade bookshop disclaims liability. Regarding deliveries outside metropolitan France, the customer is responsible for importing the articles ordered into the country of destination. He/she is responsible for obtaining the necessary information from proper local authorities and for rigorously complying with special importation formalities for said articles on the territory of the country of destination. The customer shall exclusively bear any customs duties or local taxes. La Balustrade bookshop, an independent bookshop, undertakes not to disclose the personal data of its customers. The sales made by La Balustrade bookshop are governed exclusively by French law. The Paris Commercial Court shall have sole jurisdiction in the event of dispute. By clicking on the «Approve» tab, the customer represents that he/she/it accepts the order and all of these standard terms of sale.